This post will discuss about device administration and their management. Last post we looked at information about the devices and their states. You can refer that post here. This post is a step closer to device management. 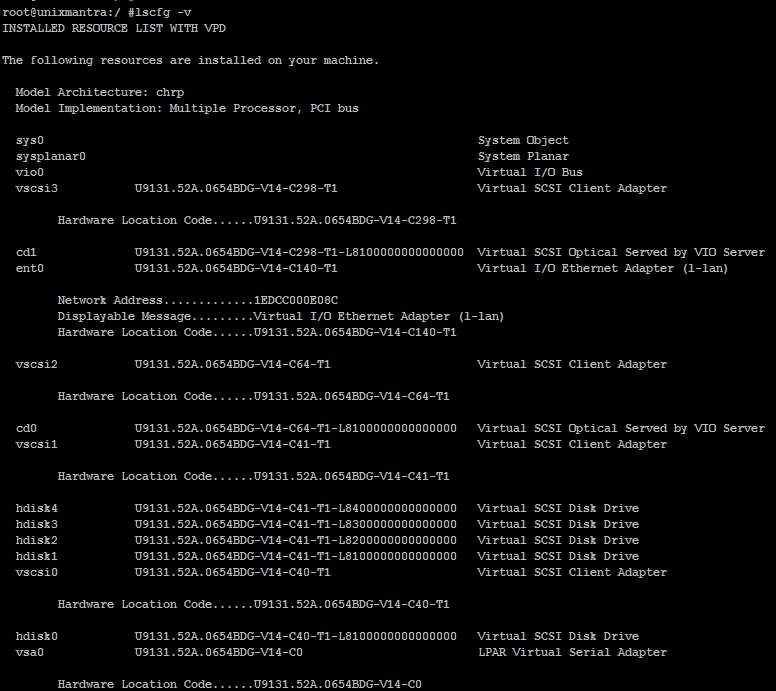 This command will list all the devices present in ODM in the system. 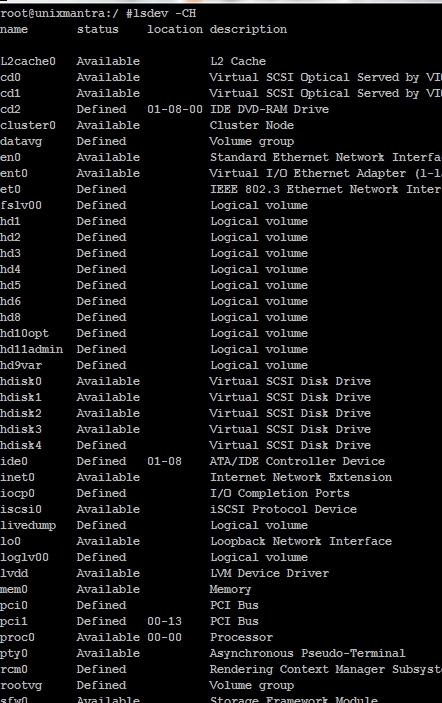 Command is used to list the configuration of all the devices present on the system. 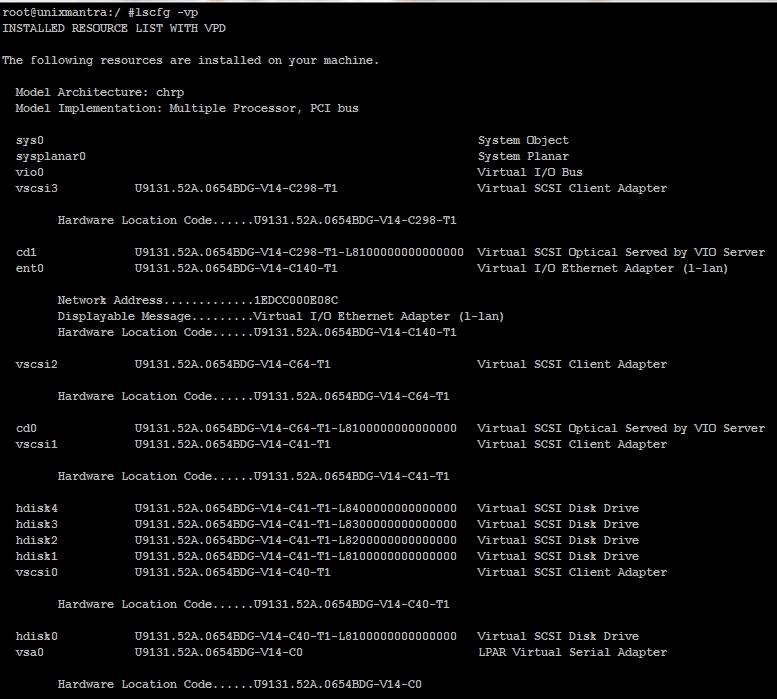 Command is used to list the complete hardware information. 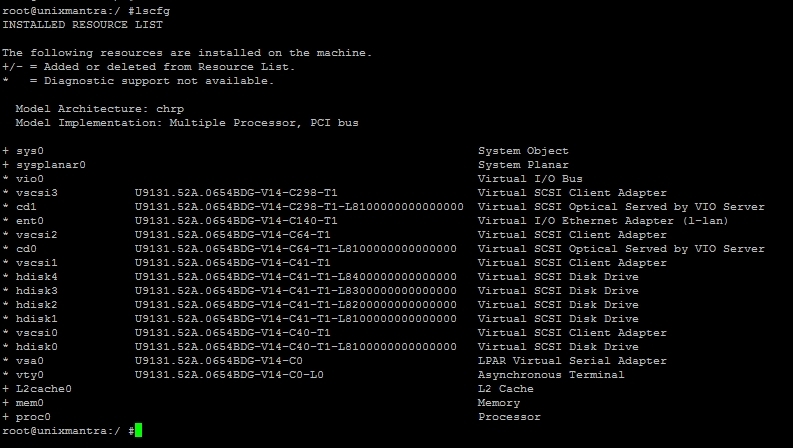 Will give complete hardware information about hdisk0. Command will give complete information in form of list of all the devices installed on the system. This information output will be detailed information available for each device installed on the machine. Will give complete information about the device installed on the machine. You can make use of help command to know more about the flags associated with lscfg command. As we have already seen devices connected to the system can have 4 states, we will discuss these states in detail now. Undefined means devices may be connected to the system but not defined. 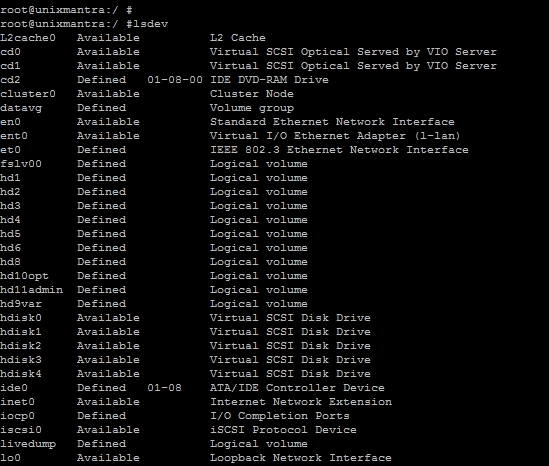 Defined means devices connected and defined but still unavailable to the system. Available means devices are defined and present in the system. Stopped means devices are unavailable but defined and not known to the system by a device number. This command will convert the raw device which is in defined state to available state after execution. This command changes the state from defined to available for the device. This performs the same functionality as mkdev command does. This command is basically used to configure plug & play devices. Freshers in AIX must remember this command from interview point of view. This command will remove the device and its information from the AVAILABLE state of devices and put the device back in DEFINED state. 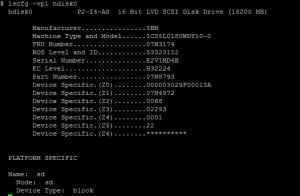 This command will show hdisk4 in defined state not available state. R flag will unconfigure all the child devices connected to the parent device. P stands for predefined and c stands for class of the device whether tape, cdrom, hdisk etc. Remember: pre-defined devices are those which are in undefined/supported state. C stands for customized and c for class. Remember: customized devices means devices are defined and available to the system. 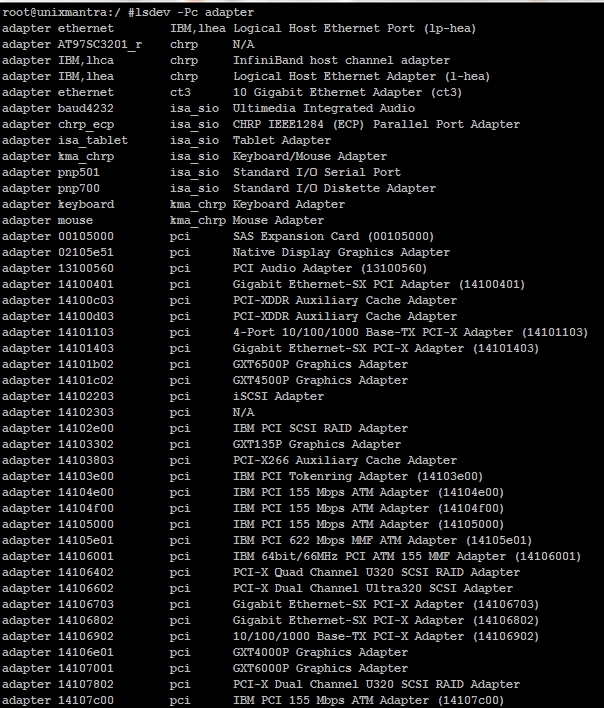 Command is used to list entire information about customized devices. 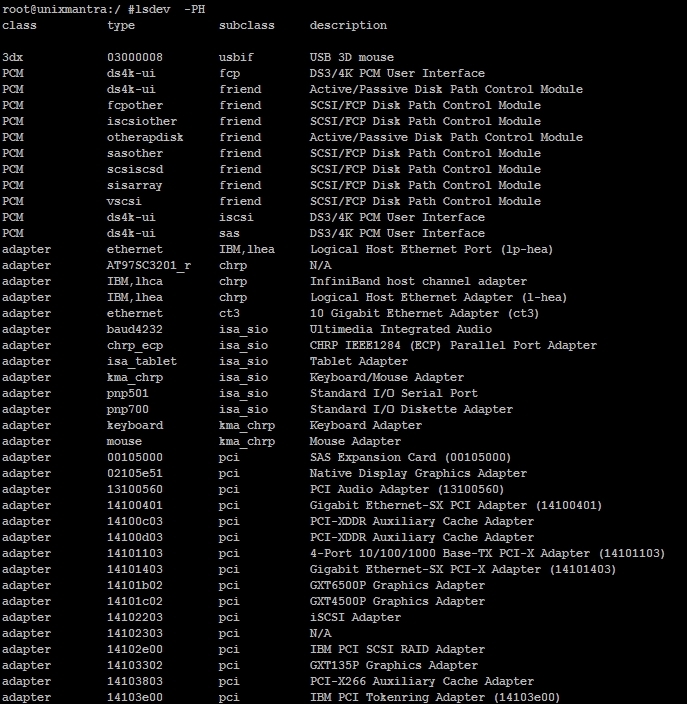 Command will list entire information about all pre-defined devices. Each adapter will have 2 interfaces. En0 is used for assigning ip and et0 is used for IEEE Ethernet interface (for research). IP is never assigned directly to the adapter, it is assigned to the interface. 256 ip’s can be assigned to a single interface. We will discuss about all these concepts in network administration as well. This will generally give speed as 332 mhz. Various bootinfo commands we have already discussed in this post.